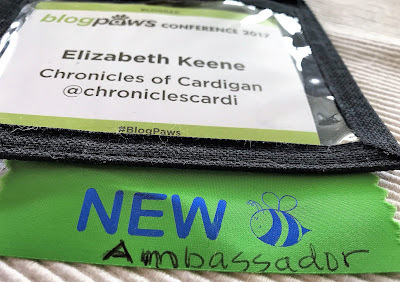 My first BlogPaws conference almost went off the rails five minutes after I checked in. It was in Tysons Corner, Virginia (outside D.C.) that year--a couple hours (in light traffic) north of me--so I drove up the morning of the first full day. Traffic was awful. 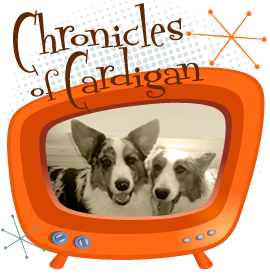 I walked into the conference at lunchtime, frazzled, never having met anyone in person, and tethered to my two hyper, young corgis. After a long walk (only taking a few steps) across the hotel lobby with dogs in tow, I scanned the dimly lit ballroom, containing a sea of tables full of attendees, humming in lively conversation. And I decided I'd rather eat almonds in my hotel room, alone, than walk from table to table, hoping some total stranger would have pity on me and offer me an empty seat. OK, that's not entirely accurate. I decided I'd rather eat alone than cold-call a table of strangers, but I'd totally sit with people I'd never met in person, if I could find one familiar online friend to introduce me. Good thing I'd exchanged cell phone info with exactly one online friend before leaving home. And that's how I met my blog idol, Laurie Eno of The Daily Corgi, in person in 2011. She ended up taking me to her table--with an extra seat--and introduced me to the staff of Oldies but Goodies Cocker Spaniel Rescue, local to the area. We hit it off instantly (Laurie, the entire rescue staff, and I), and I've been a BlogPaws fan who is sympathetic to the newbie experience ever since. The point of my story is: walking into a sea of strangers at an unfamiliar networking event can be scary, but it doesn't have to be derailing (nor a handicap, in any way). The team at BlogPaws recognizes there are unique needs for first-time attendees, and has committed resources to help. Let me tell you about them! Through me! 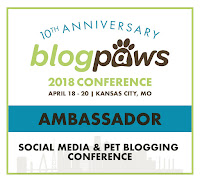 I'm not saying that to brag; I'm saying it because I'm an official BlogPaws Ambassador, proudly designated for newbies. BlogPaws values first-time conference attendees and their experience SO MUCH, that they appoint (and compensate) a designated support person (aka concierge, ring leader, breakfast host, expert introvert [yes, I am], etc.). 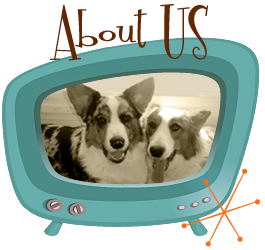 I am passionate about tending to the newbies' BlogPaws experience. Let me help you! 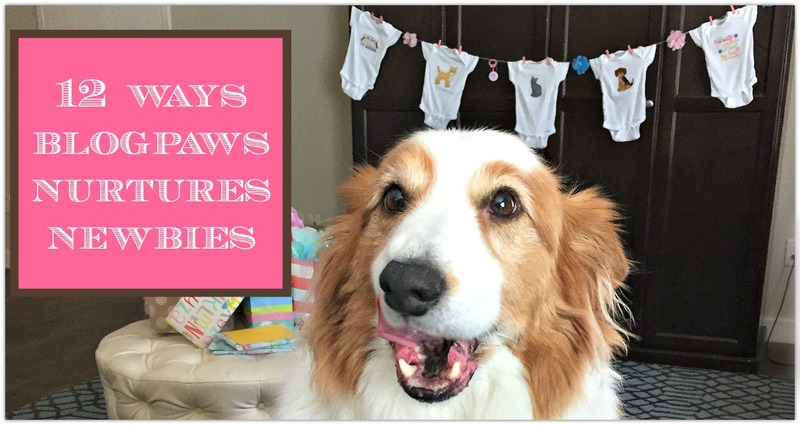 By creating the How To Prepare for the BlogPaws Conference course in the BlogPaws Social Learning Community (SLC)! Let me explain what the BlogPaws Social Learning Community (SLC) is (according to its About page): "Social learning is the practice of learning from each other. The goal of the SLC is to create a community where our influencers can learn socially with our members, our team, and our partners." So BlogPaws has an entire (free and self-paced) course in the SLC, written for and dedicated to first-time BlogPaws attendees (though, veteran attendees might learn something, too). Refer to the image below for course modules. Note: Notice ride share and roommate boards are located here (for all conference attendees, not just newbies). Tell me: what other social media conference provides a newbie resource this cool? Not one*, is what. * Based on not having found a shred of contradictory evidence. 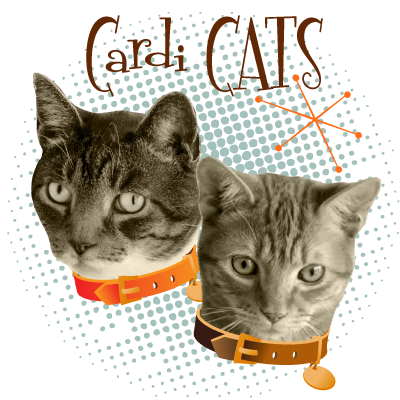 With weekly* #blogpawschat's on Twitter! This is helpful to newbies because...other conference attendees will be there! 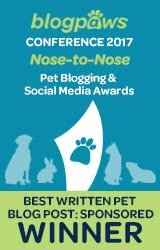 In addition, you'll get conference scoop, directly from the BlogPaws team. Be there, most Tuesdays, from 8:30-9:30 p.m. Eastern. 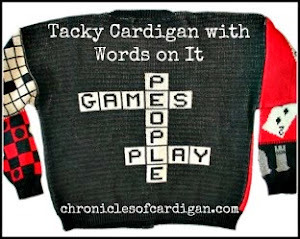 I'm @ChroniclesCardi; hope to see you! 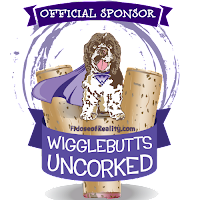 Through the BlogPaws 2018 Conference Event on Facebook! Make sure you're following it for the latest scoop, and to interact (as desired) with other conference attendees. 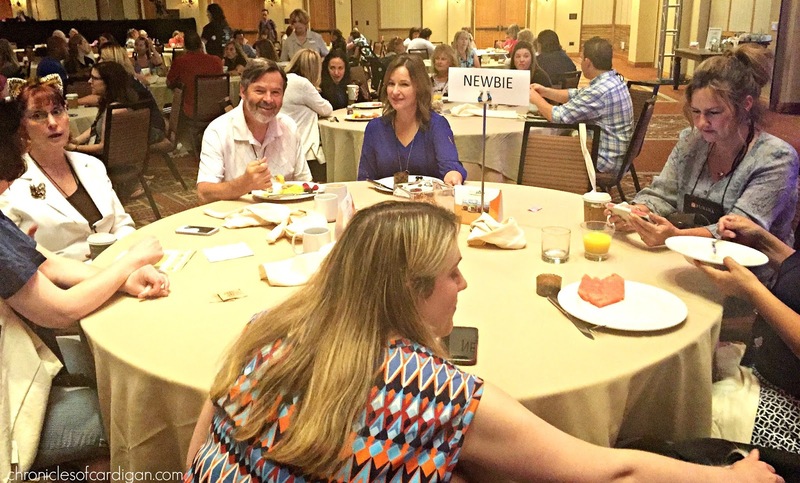 Note: Sometimes BlogPaws VIPs join the newbies for breakfast, like co-founders Yvonne DiVita and Tom Collins (pictured far left to right, respectively) and keynote, Pam Slim (pictured rear, center). By compiling this Essential BlogPaws 2018 Conference Everything Post! No, really. That's the title of the post. If there's a speck of information to be shared about conference logistics, it's in there. Through Twitter lists of all the conference sponsors and speakers! So newbies (and veterans) can follow and engage them before the conference (think networking practice). 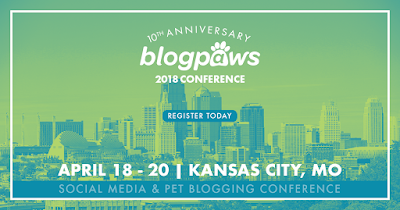 Note: Signing up for sessions in sched.org is not a requirement, it's a courtesy to attendees, and a way for BlogPaws to gauge overall session attendance. Once you're at the conference, you can feel free to attend whatever sessions/events you want! By providing cute "newbie" ID badge ribbons to wear proudly during the conference! Here's mine from last year. Last, and perhaps most important....BY ALLOWING AND ENCOURAGING ATTENDEES TO BRING THEIR PET(S)! Can you think of a better ice breaker? If so, please tell me in comments, because I can't. Hope I can attend in person next year (have a conflict this year so won't be coming 😒). Would love it if BlogPaws were held in the Rocky Mountain region to make travel a little less expensive for us Newbies. [Just wondering out loud here] Have a pawsome time! Will certainly miss seeing you in Kansas City, but I understand the cost challenge. And you're welcome to suggest locations all day! 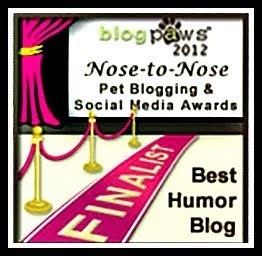 One never knows where BlogPaws might end up next. You can still be with us in spirit this year. So much helpful info for the newbie or the introvert for sure! 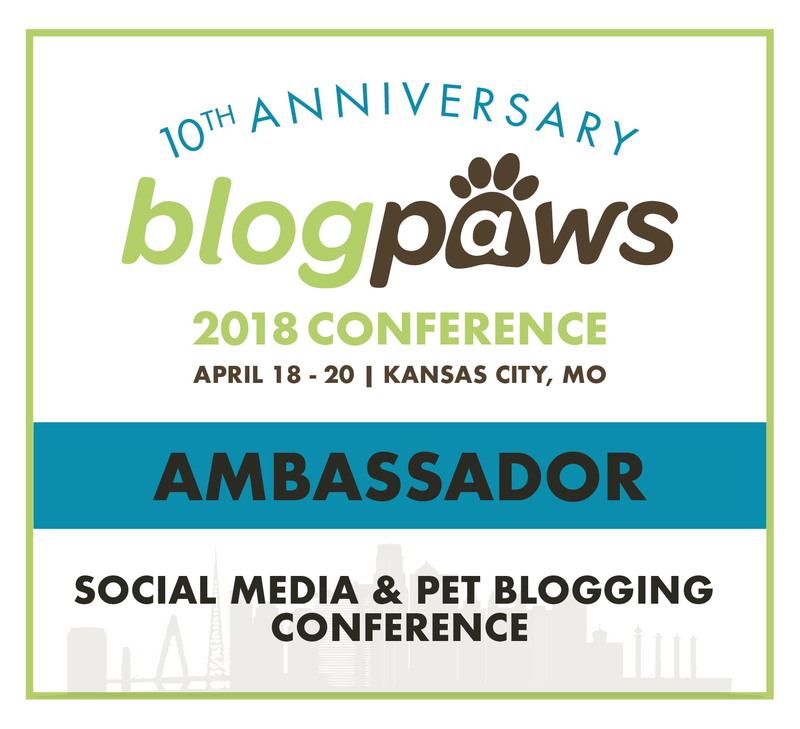 I am so excited to be a part of BlogPaws this year! I have in fact started a list of what to bring/pack but have not selected my outfits as of yet. I mostly plan to dress casual and comfortable with one dress for the awards ceremony. Yeah, if you want to bling, Friday night is your night. :) Casual and comfortable the rest of the time, though, is a good thing. There will be TONS of walking, especially with ambassador stuff. Great fun, though, and a good kind of tired! Will see you in about 5 weeks. OMG! Somehow I hadn't heard your Newbie experience before. I do know you are the PAWfect ambassador! My 1st year I pretty much felt a bit lost as well and the exhibit hall.... forget about it I might have met 2-3 brands and didn't know how to speak or approach them. The following year... I was prepared with which brands I wanted to meet (I NEVER get to ALL of the bloggers I want meet) and won the GoPro camera thanks to the Passport to Brands challenge... Can't wait to see everyone again this year!! I met you the year you won that Go-Pro and I'm so glad! This is a great list of resources! As I read through it, I remembered back to being a "new-bee" last year and how much I appreciated your ambassador friendliness and helpfulness. I did many of the things you've outlined in your post and definitely felt prepared when I arrived! I joined the SLC, participated in the Twitter chats, took the BlogPaws newbie course (with you as our helpful leader! ), sat at the newbie table, added the Twitter lists...and met you at the conference! 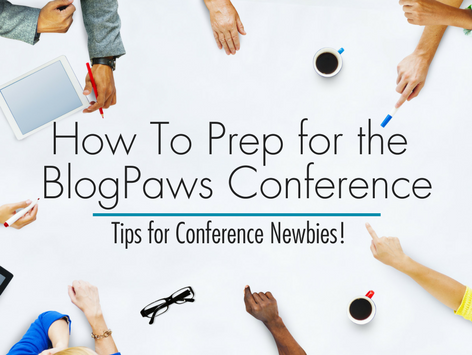 You and BlogPaws definitely help provide newbies (and not-so-newbies) with the tools needed to make the most of the conference! Thank you! You were an excellent newbie, Jenise! Can't wait to see you! I will be a newbie this year. First official blogging conference. very nervous because I am quiet until I warm up. I am also excited to go too.